This summer’s Maker Monday programs (for ages 8-18) have included a variety of opportunities to explore and create. During a recent Monday, a gaggle of kids and teens joined us at the library to learn about electricity and play with some new toys. After sharing the Makey Makey with preschoolers during a storytime the previous week, I wanted to include older kids in the fun. Along with the BrushBots we made, the Makey Makey offers a perfect tool for talking about electricity in a way that makes the learning process fun and relevant. We began by talking about electricity. We shared how we use electricity and its sources. 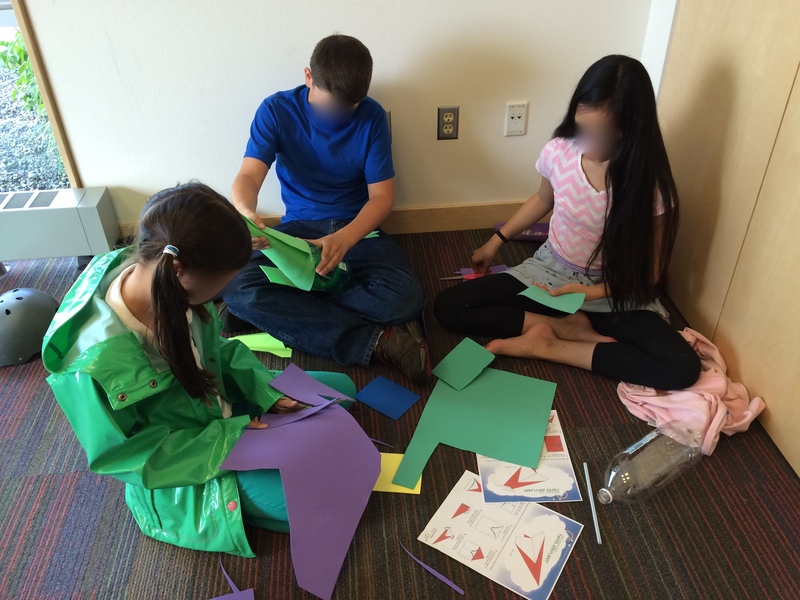 I introduced them to the tiny, but powerful, world of atoms, protons, electrons, and neutrons. Our discussion included the ideas of neutrality, balance and how energy moves. The conversation also included a static electricity experiment (rubbing balloons on our hair) and the significance of the closed circuit or loop. Need some videos to refresh your knowledge about electricity? Check out the old School House Rocks electricity video or Bill Nye’s video. Here’s a helpful information sheet that might come in handy also. At this point, the kids were ready to put their new knowledge to work. None of them had ever seen a Makey Makey before and they were all curious to see what it could do. I showed them this brief video to get them thinking. “How do they do that?” was my favorite comment! We then spent about 30 minutes testing the conductivity of various items and using the tool to make music and play games as a group. I encouraged the group to throw out any ideas they might have about how the Makey Makey should work. I shared with them the recent study about preschoolers and their ability to figure out tech gadgets more easily than much older college students. The researchers found that the preschoolers didn’t have preconceived ideas of how they should work, making it easier to explore how the machine works. They openly explored what was possible. Engineers and makers often do the same thing I told the group. 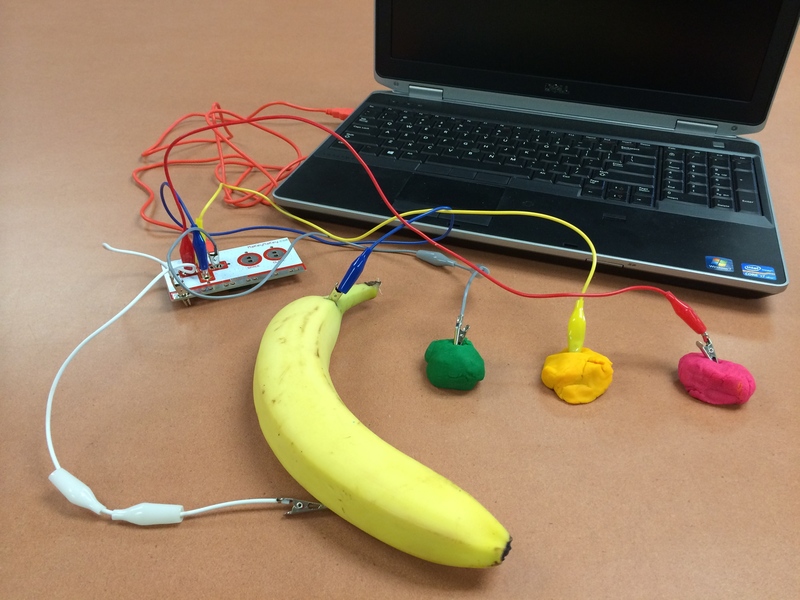 As we began to try out the Makey Makey we focused on the basic set up, using just the four alligator clips that turn a banana, or purple play dough, for example, into an arrow key. 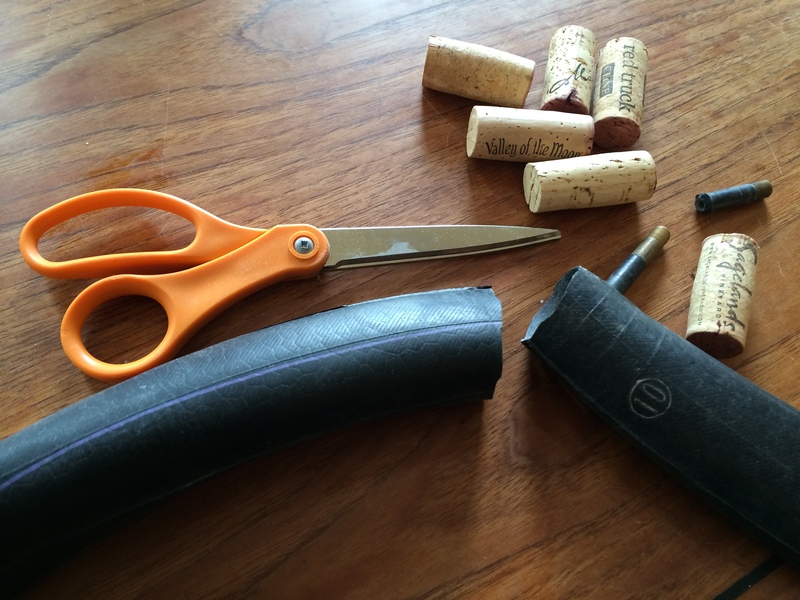 All the while, I reinforced the idea of the loop or closed circuit. This was the idea I picked as a take home for the group. 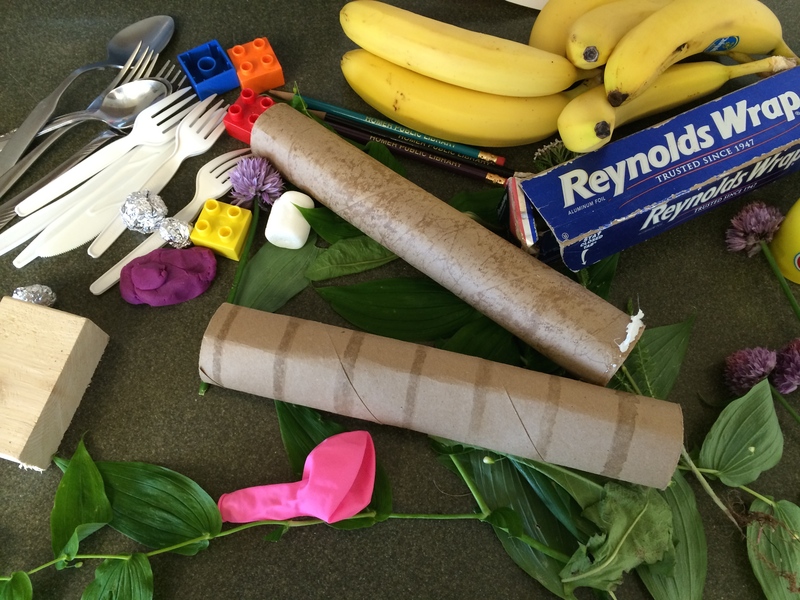 Here are some of things we tested with the Makey Makey. After playing with the Makey Makey, most of the makers needed a break. The two hour program is long enough to really play with some of these tools and ideas, but a snack helps keep everyone exploring. It worked out perfectly. We’ve had big crowds attend our Maker Monday programs and most weeks I don’t require registration. This week, I had to change that. I only budgeted for 24 brush bots so kids could take home the bot and keep exploring. I signed up 23 makers, leaving one for an example and back up if any parts broke. I explained how to make a bot and once again talked about electricity and the importance of the close circuit. The makers divided themselves into two groups and got to work at the tables where they found the bot parts. All of the parts are easy to find separately, especially if you’re making a smaller number of bots. For this program I bought two BrushBot party packs that came with stickers and were slightly cheaper than buying them another way. Once the BrushBots were complete, it was time to race them! 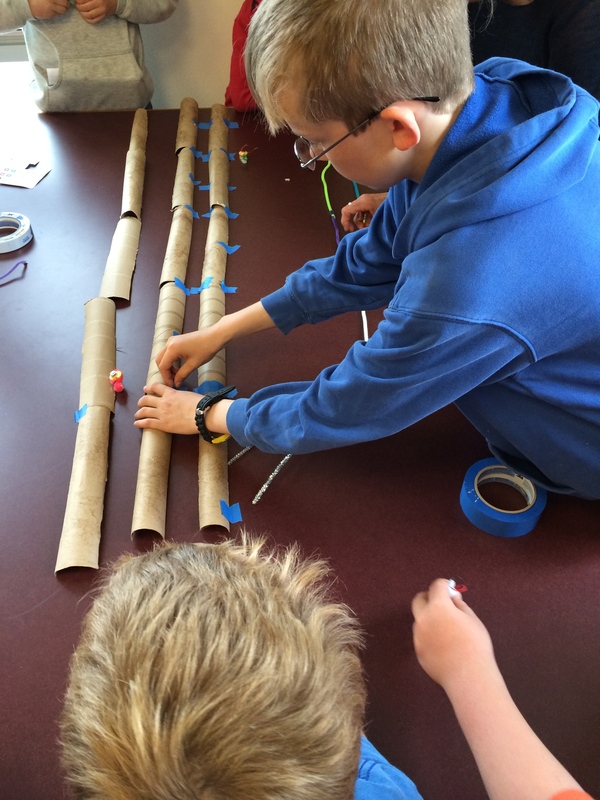 One of the regulars to the Maker Monday programs started designing and building the race course out of the cut paper towel tubes I brought along. Other racers quickly jumped in to help. The bots raced on the table between the cut tubes, not inside the tubes. What we learned: Tape must be added only on the course if it doesn’t cross the track because the bots struggle over the tape. The tubes make a nice border, keeping the bots moving forward. Also, racers should have time to modify their bots during different heats. Our race was pretty informal, but the racers definitely fiddled with their designs to see if they could make it buzz down the track straighter, for example. 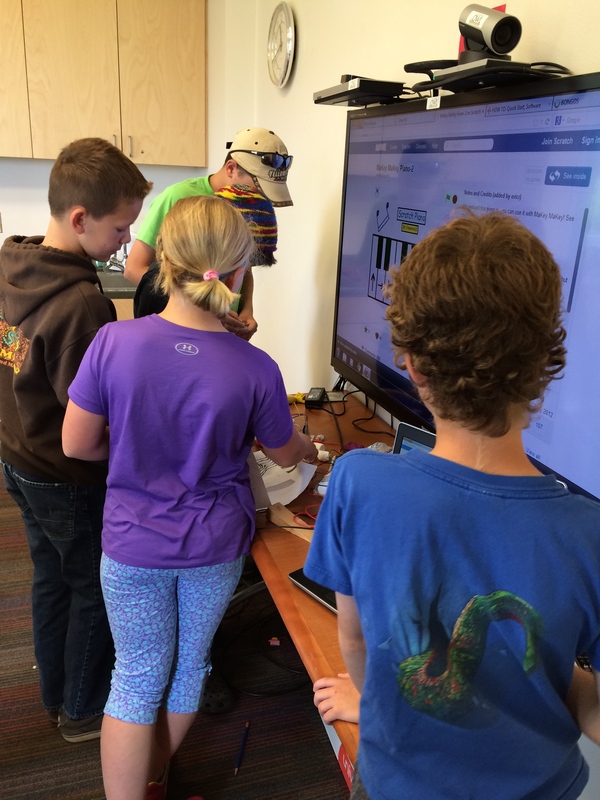 After building the bots, several makers wanted to go back to the Makey Makey which was perfect. Some makers ended up racing and modifying the course, others played with their bots and the rest played tetris with a pencil drawn game controller or piano with marshmallows. Other librarians are using Makey Makeys also! Check out posts by Liz at Getting Giggles and Amy at The Show Me Librarian. 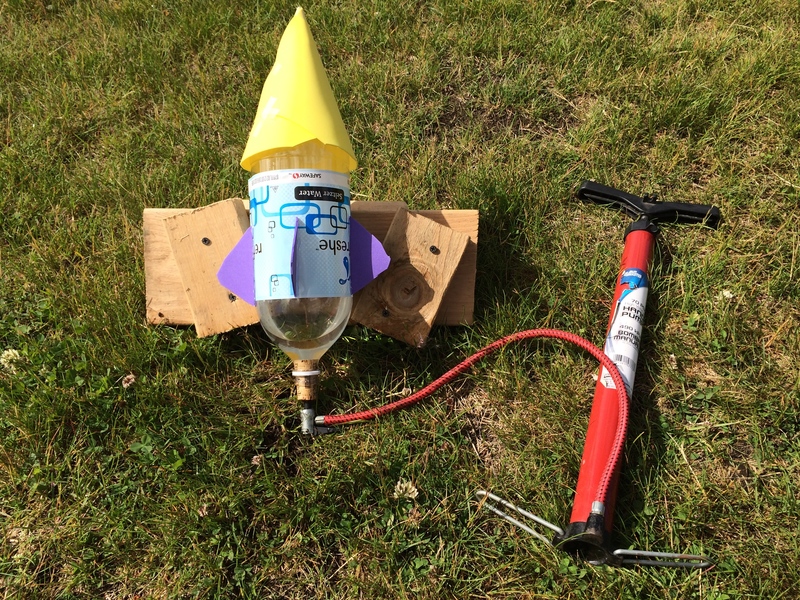 For the second summer, we are offering a series of maker programs for ages 8-18. While we don’t have a dedicated maker space, we do have a strong desire to convert library resources into a temporary maker space each week and amazing community experts willing to share their knowledge and craft. These programs are way to much fun to not do because of a lack of dedicated space. In fact, I’m slowly trying to make the whole library a maker space in varying degrees. Don’t tell my coworkers… Just kidding! They are maker fans, too! Our two hour pizza making session was inspired by the book Starting From Scratch (Owlkids Books, 2014) by Sarah Elton. 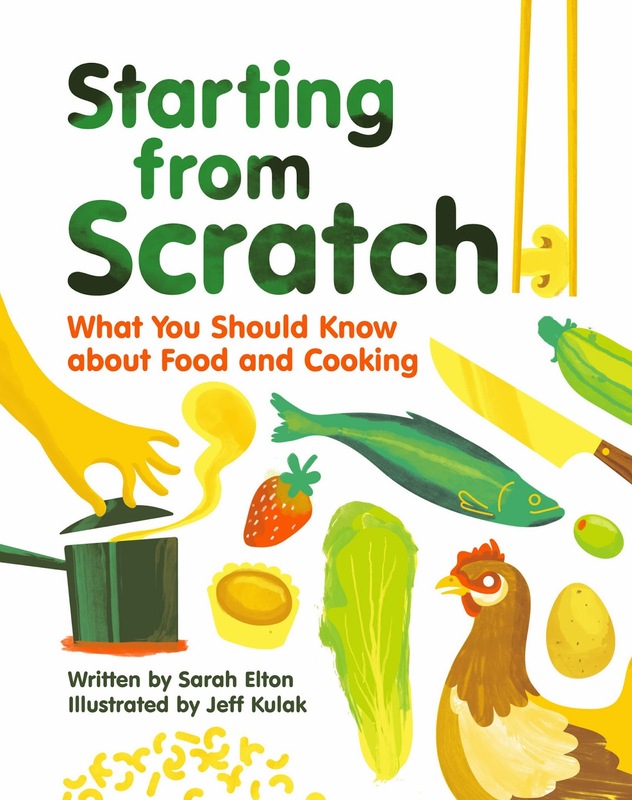 The book covers everything from the science of cooking, our sense of taste, cooking tools, and how to read a recipe in a friendly format for kids 10 and up. I love to cook and introduce kids to good food, so when I received the book I immediately knew we needed to make food this summer. I just wasn’t quite sure how to make it happen so I stewed on it for awhile. Then, a friend came to mind. He has a mobile wood fired oven and loves the library so I emailed him with my crazy idea- let’s make pizza at the library! He said yes, because he likes crazy ideas too, and really it wasn’t that nutty. There were nuts though. My friend (and a couple of others) handled the oven while I focused on the science of making pizza and the how-to. The session began with a quick video showing a 7 year old doing cool tricks while tossing pizza dough. I then asked the crowd of almost 70 why could he do that? There were actually some really cool responses that had to do with the physics of tossing dough, but no one spoke up about the magic of gluten. So we spent a few minutes going over the ingredients in dough, the reactions that take place during pizza making, and what each ingredient does. The pizza dough was made beforehand, but we had all of the ingredients on hand to showhow it all works. Have you listened to the Science Friday episode Food Failures: Knead to Know Science Behind Bread? It’s worth listening to! After dough, we talked about toppings, what everyone likes on pizza, and the building blocks of taste. We even discussed super tasters and terroir as it relates to cheese (and chocolate, wine, coffee, etc.). Both ideas fascinated the crowd of mostly 8-14 year olds. Then it was time to make pizza! We had a large group packed into a meeting room with two large tables. Since the room is carpeted, we laid out a big plastic tarp to avoid a long clean up. On the two tables we had a variety of ingredients (identical on each table). Each person washed their hands at the sink and were then handed a small ball of dough. They could roll out the dough with a rolling pin, use a crank my friend brought, or try the method I saw on the America’s Test Kitchen video A New Way to Work with Pizza Dough. Next came the toppings. I challenged everyone to try something new, even if it was only on half of the pizza. Most created pizzas beyond the expected pepperoni and cheese. We only had 4 peels, so a mom quickly came up with the idea of flouring a paper plate for each person and letting them top their pizza on the plate instead of waiting for the peel. Then they could go outside to wait for the peel and their pizza’s turn in the oven. Once outside, pizza makers waited in line for their turn. Everyone was surprisingly patient. Fortunately the weather was excellent. It didn’t hurt that everyone could watch the dough rising as the fire did its magic inside the oven. We also had sampling table so some pizzas could be cut into sharing bites. Most people ate their pizzas outside on the grass or under the entryway’s overhang not far from the oven. All of the library visitors were curious about the oven and what we were up to! Our summer reading program starts today. Hundreds of kids, teens, and adults will read, discover and explore together now through the first of August. Like many libraries across the country, we are using the Fizz, Boom, READ theme for our kids program and the Spark a Reaction theme for our teen program. As a huge fan of integrating STEAM into storytimes and other library programs, the science oriented summer program has been fun to plan! Behind the scenes, our theme is slightly different. I see the library as part of our community’s information web. Not only do we provide access to a plethora of resources in the library and through our website, but we connect patrons with experts and resources beyond the library. 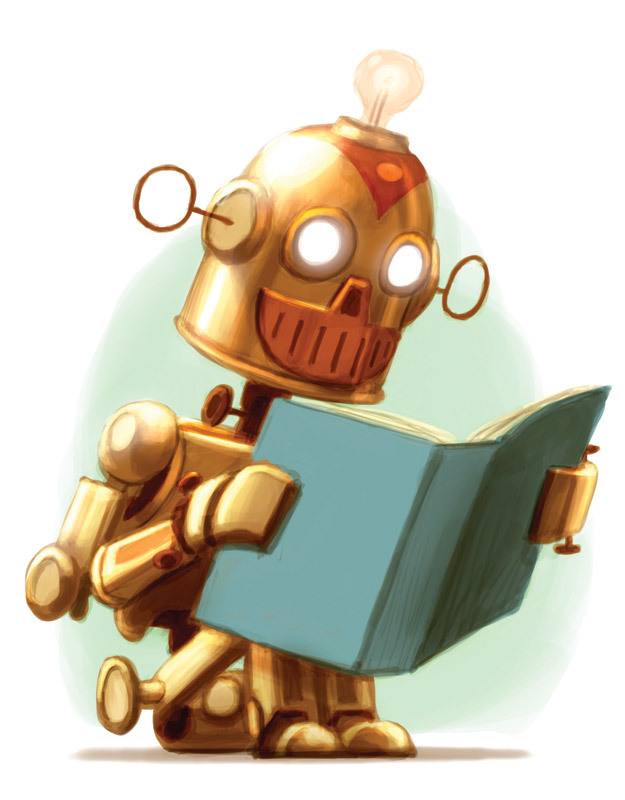 This summer we’ve expanded our community connections, integrating local artists and experts into our Maker Mondays sries, our special events, our reading log activity pages, and even our reading prizes. I want kids to know their community and discover the many mentors that might help spark new interests and help develop growing talents. Here’s what community connections we have planned for this summer. For two hours each Monday in June and July I or a local expert will explore a new idea to help kids ages 8-18 to create with high and low tech tools. Programs include: Make Your Own Pizza (with a local mobile wood fired pizza oven), Sweater-T-shirt Chop Shop, Propulsion & Flying Machines, Electricity & Brush Bots, Multimedia Art, and 3-D Printing. Our preschool EXPLORE storytimes during the summer include a larger ae group and could be consider family storytimes. Kids ages 3-7 hear stories, sing, dance, play and explore multiple stations run by a teen assistant and myself. We successfully redesigned our summer storytimes last summer as part of our plan to offer regular programs to all of our kids under eleven. We also continue to offer our toddler storytimes throughout the summer. Themes include: Taste & Smell, Water, Sound & Music, Simple Machines, Independence Day, Construction, Robots, and Camouflage & Colors. We’ll also welcome local naturalists for two storytimes during the program. Throughout the summer program we’ll be hosting a variety of events featuring both community members and visiting presenters. Programs include: Dogs and Crime Science with a local K-9 Unit, Beauty and the Beast Marionette Puppet Show, Stuffed Animal Sleepover, 4th Annual LEGO Contest, a Robot Sumo/Arduino Programming Workshop, a Sci-Fi Fan Fiction Writing Contest for teens, and a second 3-D Printing Demonstration (for adults). At our local museum, a special exhibit will be on display all summer. It focuses on the living history and Indigenous System of Knowledge of the Dena’ina people, Native Alaskans. In support of the exhibit, we have included an activity page from the exhibit in our reading log with information about the exhibit and we will welcome a Dena’ina storyteller to the library for a family program. One of our reading prizes includes a magnifying glass. When I ordered them I intended to award them by themselves, but then I came across the nature scavenger hunt in the SRP manual. I had an idea. I bagged up the magnifying glass and a copy of the scavenger hunt in a plastic bag. When I was talking to a friend who is a local environmental educator, she told me about a nature trading post they have at their visitor center. 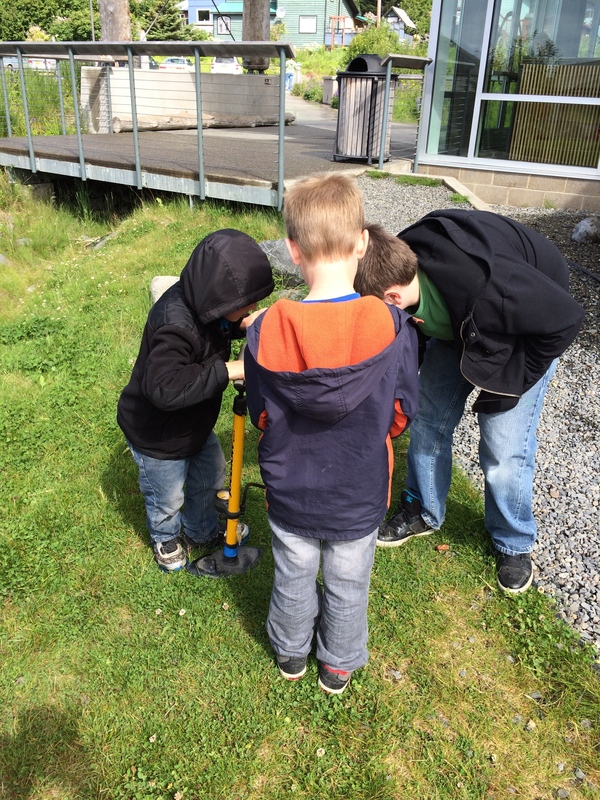 We came up with the idea to include information about the trading post with the scavenger hunt so kids could trade any cool objects they find during their hunt. They can also return their bags and completed hunt for a prize drawing at the end of the program. And the very smart friend? She’ll be presenting about Shackleton and the Endurance to celebrate the 100th anniversary of the dramatic expedition. For the third year, our library will host Teen Night @ the Library, as part of the National Teen Library Lock-in event. Last year almost forty libraries participated in virtual author visits, games, and challenges. Each library plans their own event and then connects with others in different ways. This year I am working with librarians and IT folks to host a Minecraft event that will allow teens at libraries across the county to explore the same Minecraft world at the same time. Want to know more? Check out Chain Reaction!